WooCommerce Google Product Feed – To increase your WooCommerce based product sales: Explained! Put on your thinking cap and answer this simple question. Tip: Keep thoughts about the WooCommerce Google product feed. What is better than your new online business based on WooCommerce? – Probably, the old one! But, if both are helping generate an equal amount of revenue, does it matter? Another question: What can help to start your online store right away? – WooCommerce plugin on WordPress! And, the final question: What can help you start selling immediately for the new store and increase sales for your old store? How about making these two, the renowned eCommerce platform and the search giant work together to help you stabilize your income and keep growing your business? Thinking about WooCommerce Google product feed now? Great, that’s what we’ll cover here. How does Google Shopping work to sell your WooCommerce products? Your Google Shopping campaign is powered by the product feed you send to Google Merchant Center and Google Adwords. These fuels your product data and bidding strategies for your products. When someone searches for your product or related information on Google Shopping, your products come on the top. Partly, this is determined by your bidding strategy on your shopping campaign and partly it is affected by the product information that you sent to the Google Merchant Center. We’ll not get into detail about setting up your Google Shopping Campaign here. But if you need more information regarding this, you can find it here. So, when people find your products on Google Shopping and they click on it, they will be redirected to make the purchase on your shop. As you provide the product page URL in your WooCommerce Google Product feed file, your visitors will land directly on that URL so they will bypass the other steps on your conversion funnel. 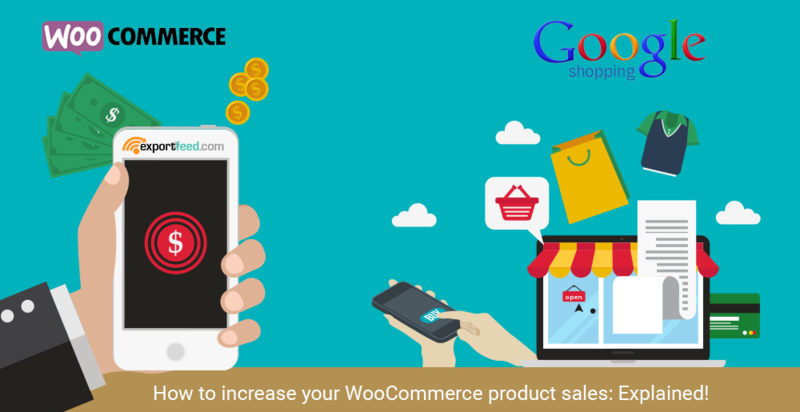 One more benefit of integrating WooCommerce with Google Shopping is that you get the SEO benefits. The traffic that your product page receives is the qualified traffic that is highly likely to convert into buyers. For this reason alone, the bounce rates on those pages will be low. So, if you have taken efforts to implement on-page SEO on your product pages, they have a chance to win a prominent position on the organic SERP as well. You get targeted visitors to your site who are willing to purchase your products. Your bidding strategy is based on your decision so you have total control over cost. Reports that you get for your click-through rates and bidding suggestions are invaluable. How to get your WooCommerce Google Product Feed work the best for you? Product feeds or data feeds are created in order to send your eCommerce store’s product information to the sales channels. Generally speaking, there are three types of sales channels. Comparison shopping engines, affiliate platforms, and marketplaces. Google Shopping is one of the best comparison shopping engines. It displays products based on the product information (attributes) received through Google Merchant Center. So, your product and pricing need to be competitive as compared to the market trends for the specific products. Also, as Google shopping displays your products based on the product attributes, the more product attributes you include in your WooCommerce Google product feed and not according to the keywords you set, so, you always get the better results. brand, id, item_group_id, title, description, link, product_type, google_product_category, image_link, condition, availability, price, and MPN. Depending on the product category that you are sending to Google shopping, your products may also require the additional product information. Sending these additional product attributes to Google Merchant has huge benefits. But it is a cumbersome task to manage additional products attributes on your WooCommerce store. So, how do you include the required and additional attributes in WooCommerce Google product feed? The answer is quite simple. Simply install the ExportFeed plugin on your WordPress site alongside your WooCommerce plugin. ExportFeed will help you create your product feed for Google merchant and map your WooCommerce product attributes to that of Google Merchant. While using ExportFeed, you will get the product feed file link that is stored on your own server. So, you can edit and apply different optimization on your WooCommerce Google product feed. You can even optimize your Google Shopping campaign to increase your sales based on the Google Shopping Campaign reports. And for this, if you need our help, don’t hesitate to contact our support team. Sell your products from WooCommerce to Google Shopping!